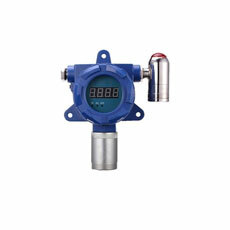 Fixed hydrogen gas detector is generally composed of on-site hydrogen detector (also called probe), connecting cable and alarm controller (host), and is widely used in hydrogen gas related industries, such as petroleum refining, gas production and transportation, chemical and pharmaceutical industry, so as to detect hydrogen leakage or excessive concentration per unit space, prevent accident and ensure production and personal safety. When the hydrogen detector detects that hydrogen concentration exceeds the standard, it converts the gas concentration signal into electrical signal and transmits the signal to the alarm controller. When the hydrogen concentration exceeds the set alarm value, the alarm controller gives audible and visual alarm to warn the duty personnel to take appropriate safety measures to avoid or reduce accident losses. In installing the hydrogen detector, if the detector is installed, please do not move it randomly; make clear the possible leakage points and the leakage pressure in case of a leakage, as well as the direction of gas flow, so as to determine the installation position of hydrogen alarm probe. The leakage shall be divided into three grades of Ⅰ, Ⅱ and Ⅲ to show the serious degree. Study the leakage state at the leakage point, a slight leakage or spurting. If it's a slight leakage, the position shall be closer to the leakage point. If it's spurting, the position shall be a little further from the leakage point. A monitoring point should be set every 10-20 m for places where there is a great possibility of leakage. Because hydrogen is lighter than air, it will float upward after leakage, so the hydrogen alarm shall be installed above the leakage point. For an open hydrogen leakage, if there is no good ventilation conditions, the hydrogen is easy to accumulate in a certain location, resulting in excessive hydrogen concentration and thus leading to accidents. The hydrogen gas detector shall be installed at a height of 170cm, so that operators can see the screen display and the daily maintenance. There should be no strong magnetic field around the hydrogen gas detector, so as to avoid disturbance to the instrument. The shielding wire should be well grounded.